Wine producers expect this year�s harvest to be of very good quality but supply is outstripping demand in some parts of the country as price concerns in the industry linger, according to sources. Data from the National Professional Association of Vineyards and Wine (EDOAO) show that in some areas, such on as the northern Aegean island of Lemnos, producers are reluctant to move ahead with the harvest due to the low prices offered for grapes last year. Problems in the industry could also be recorded in the Peloponnese�s Nemea region, as experts point to the different maturity rates among grapes hanging on the same branch. Producers have been putting off the harvest waiting for better weather conditions in September but it looks like nature is unlikely to help out, a source said. Data show that this year�s harvest is expected to produce good-quality to exceptional grapes on the Aegean Islands and Crete. This year (Santorini�s) production, especially in the red varieties, will be slightly higher, up by 10 to 15 percent (over last year), oenologist Christos Kanellakopoulos told Kathimerini. 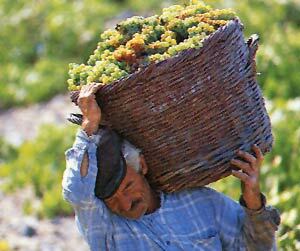 The harvest on Santorini, an island with a developed wine industry, was completed earlier than normal this year due to warm weather at the start of August. Similar conditions existed on the fellow Cycladic island of Paros.